Nose: Alcohol, vanilla butter cream frosting, oak, blondies, white pepper. On the palate: Full-bodied, sweet, vanilla frosting, then it evaporates off the tongue. With a little water, the oak comes close to taking over. There is still a good amount of sweetness, and vanilla though and a bit of allspice and ginger to boot. Finish: Big oak, then hot, hot hot and a long, lingering burn. With water, still some burn, but a little white chocolate, oak, turbinado sugar. Parting words: When United Distillers Corporation was merged out of existence, Old Fitzgerald, the wheated bourbon flagship of the closed Stitzel-Weller distillery, went to Heaven Hill. The quality of Old Fitz had already been declining and the sale didn’t make it any better. Its reputation tanked, and not without justification. The conventional wisdom was that the folks at Heaven Hill just didn’t care about wheaters. The previous entries in the Parker’s Heritage Collection (named for Master Distiller Parker Beam) were both from the rye bourbon mashbill. 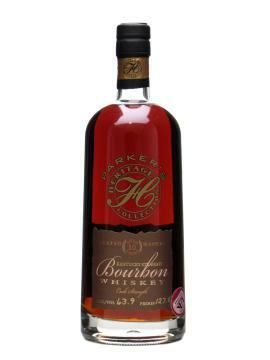 When this wheated bourbon edition was released back in 2010, it was something of a revelation. It has the sweet vanilla flavors one expects but it has power that few wheated bourbons have. Let’s hope it’s a sign of good things to come. Parker’s Heritage Collection: Wheated Mashbill was an instant classic, and is pretty hard to find on shelves, but there are still some out there. It’s not cheap, either, but it’s worth every penny. Highly recommended. I still have a third of a bottle at home. Damn fine whisky! No doubt! One of the best. When I first opened mine, I was appalled at how spirity and woody it was. I wanted nothing to do with it and was cursing myself for skipping other bourbons. I tasted it once a month for several months, and little by little, I could come closer to tolerance. Now it’s as gentle as a lamb, showing cinnamon, milk chocolate, and chocolate-covered cherries, with only a wood accent where those imposing trees used to be. I think this one does amazingly well with air. It’s my favorite wheated bourbon. One of the great things about visiting Heaven Hill is that the guys who run the tasting room are very generous–within the two drink limit, of course. When you are part of the tour, you get what they are pouring but if you show up on your own they ask what you would like. In March, I asked for the PHC Wheated and it was produced immediately. It is not a cheap pour and there is no more where that came from so you might expect them to be stingy with it. Simply marvelous bourbon!